This is a Story about the symbolism contained in the old classic "THE WIZARD OF OZ", and a warning from the Author from the past. That could not speak out against what was going on in the U.S. Government and Financial Institutions of the USA. This is all allegorical and metaphors are always in the eye of the beholder, and unless an author has explicitly explained just exactly what he or she was trying to say in a particular work – and the Author of the “The Wizard of Oz”(L. Frank Baum) never revealed his true intentions with respect to The Wizard of Oz to anyone – there will always be room for disagreement and variations in interpretation. L. Frank Baum published the book in 1900, just after the US emerged from a period of deflation and depression. Prices had fallen by about 22% over the previous 16 years, causing huge debt. The US was then operating on the gold standard - a monetary system which valued the dollar according to the quantity of gold. The Populists wanted silver, along with gold, to be used for money. This would have increased the US money supply, raised price levels and reduced farmers' debt burdens. Dorothy – The innocent all-American girl who represents virtuous, hard-working citizens who were attracted to radical politics because they realized things had gone terribly wrong and that something needed to change. Toto(The Little Dog) is defined in legal dictionary as- Toto(in toe-toe). Latin for “completely” or “in total”, referring to the entire thing, as in “the goods were destroyed in toto” or “the case was dismissed in toto”. The Scarecrow – The origins of the term are unclear. The usage of the term in rhetoric suggests a human figure made of straw which is easily knocked down or destroyed, such as a military training dummy, scarecrow, or effigy. Some say are the American farmer, who was often portrayed as illiterate and brain-dead by elite policymakers who feared their radical activism, or as in the” Strawman” as a component of an argument and is an informal fallacy based on misrepresentation of an opponent's position or as person defined under Uniform Commerical Code(UCC). In the Legal Dictionary it defines the “Strawman” as- (1) Transaction involving property; (2) Agency of one or more persons on behalf of a another person or artificial entity who accomplishes the commercial transaction; or (3) Property being acquired by a party that otherwise is not allowed or not lawful. The Tin Man – The American industrial worker, who has been exploited and treated like just another piece of machinery by rich and powerful employers, or does Taxpayer Identification Number(TIN) recall anything to mind? The poor TIN man just stood there mindlessly doing his work until his body literally froze up and stopped functioning. He worked himself to death because he had neither heart nor soul. He’s the heartless and emotionless creature robotically carrying out his daily tasks as though he were already dead. The Cowardly Lion – This was William Jennings Bryan, The Democratic candidate for president in 1896 and 1900, who was nicknamed “The Lion” for his fiery rhetoric and called a coward by many for his refusal to support America’s decision to go to war with Spain in 1898, or could it be the modern military war machine rhetoric with no heart for real war on a battlefield to fight face-to-face. The Munchkins – The poor tired mass of citizens in the United States, enslaved by powerful interests and clueless about what to do to change things. The Yellow Brick Road – The gold standard. The monetary policy was a huge political issue at the time, with big businessmen generally supporting tight money and the gold standard while reformers favored an enlargement of the money supply through the coinage of silver or the issuance of paper money. All of which lead to the Private Banks sweeping cross America at the time, and now all the gold leading to the World Bank. Dorothy’s Silver Slippers(in the book they were silver, not RED as in the movie) a representation of silver. Just as many in the book believed the silver slippers that Dorothy had acquired after accidentally killing the Wicked Witch of the East had magical powers, many farmers, laborers, and small businessmen believed that expanding the money supply by putting more silver in circulation would stop the boom-or-bust business cycles that plagued the economy during that time. More money would increase demand for goods and services, freeing up more funds for smaller investors and making things easier on debtors hurt by tight monetary policies that kept the value of the dollar artificially high. In the movie the magic slippers were changed to ruby, so the importance of this metaphor was obscured. The Wicked Witch of the East – A stand-in for Wall Street financiers, eastern elite big businessmen, and Washington politicians. The Wicked Witch of the West – Were western industrialists, bankers, and the railroads. The Good Witch of the North(Glinda) – Where Midwestern farmers and others in the heartland who were strong in their opposition to the powerful elites who ran the economy and the political system. The Talking Apple Trees in the Forest- Dorthy tried to take/pick a apple from a Apple Tree, and the Apple Tree talked to her telling her not to eat/pick his apples. The Tree was un-natural like the geo-engineered trees/plants(eg, fruit and vegs of today). The Scarecrow then tricked the tree by manipulated the tree by teasing it so the tree would throw it’s apples at them for Dorthy to get to eat. The Poppy Field- What about the trip through the field of poppies? Did you notice how this had no narcotic effect on the Straw Man(no brain) or the Tin Man(no heart or soul)? They weren’t real people, so drugs could not influence them. The Wizard of Oz was written at the turn of the century, so how could the author have known America was going to be drugged? The British Crown(like the USA Today) had been playing the drug cartel game for centuries. Just look up the history of Hong Kong and the Opium Wars. The British Crown already had valuable experience conquering all of china with drugs, so why not the rest of the world? Snow- After Dorthy feel asleep in poppy field the Scarecrow and Tin Man cried out for help and Glinda- The Good Witch of the North made it snow(ie, cocaine) to counter the effects of the poppies(ie heroin). It should be noted that both drugs were legal in the USA when the book was wrote. Oz – The abbreviation for ounce, which was significant because bimetallists wanted silver coined along with gold at a ratio of sixteen ounces of silver for each ounces of gold. The Wizard – Any President of the United States, whose power was ultimately illusory. The Wizard, like everybody else, was just trying to survive and was really subservient to the power of the Wicked Witches of the East and West. Parallels between the Wizard and William Jennings Bryan have also been noted, possibly because Bryan had been a candidate for the office of president twice. The Yellow Brick Road- After Dorthy lost control of the house from whirlwind tornado and it landed on the witch. Dorthy followed the yellow brick road(ie, US Gold that is no longer in Fort Knox and that originally backed US Currency) all the way to the Emerald City(ie, The World Bank). 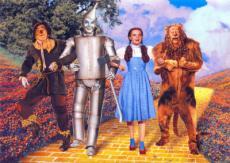 She had/met help along the way with the Scarecrow(brains); Tin Man(heart); and Lion(courage). Once there Oz(The President) pulled strings to scare them away, and was finally revealed as a puppet behind the curtain of Emerald City(The World Bank). © Copyright 2019 JR Ziegler. All rights reserved.